With a very short 3 to 3 1/2 month growing season here in northern Minnesota, I need a little help with the blooms. I seldom use much fertilizer at all until the temps warm to at least the mid 70's during the daytime. I sprinkle a scoop full in each planting hole, stir up the hole a bit with the hand digger, and plant. I use this timed release granular fertilizer on all new annuals and perennials. I was given a great tip from a local nursery many years ago, and I use it still till this day. I was told by an elderly greenhouse owner to water my pots with weak fertilizer every time I watered them. That's right every time. The directions on this box of fertilizer call for one green scoop per gallon water. But I add a half of one tablespoon to the two gallon watering can, and then fill it up. If this seems like a lot of fertilizer, remember that most of the water poured into a container runs out the bottom holes. So my annuals that start out like this at planting time. Fill out like this every time! So once the soil is watered down, I mix one full green scoop full to the two gallon watering can. I water each plant individually with a small amount of fertilizer water. It usually takes me about 3-4 watering cans full of fertilizer to finish my biggest bed. I try to do this every week. Sometimes it may be every ten days. I fertilize the annuals in my beds all summer. 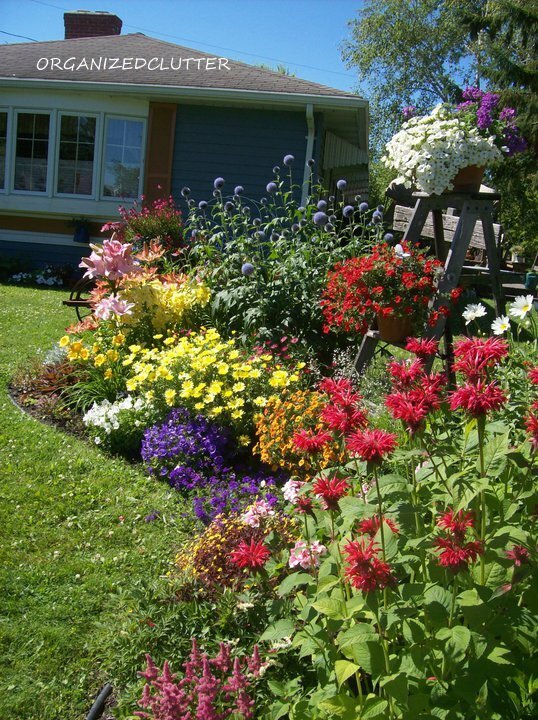 The perennials are fertilized about once a month, and only before they have bloomed for the season. With a little help from the sun and some rain, my fertilizer tips and tricks usually produce this display in my northern zone 3 gardens! I have received some comments on my Hometalk page in support of organic fertilizers and composts. I certainly am not opposed to their use. If I were a vegetable gardener, I think I would use organic fertilizer exclusively. I am encouraged that so many people are concerned for our environment. Thanks for the great tips!! I'll have to try using the watered down fertilizer in my containers. We've had SO SO much rain and cool temps, I don't have high hopes for the flowers or vegetables this year. Hopefully it warms up soon! Great tips. I like to fertilize often too. With the heat we have here in TX, using a liquid seaweed solution helps relieve the stress during the summer months. My garden doesn't look as lush and colorful as yours. Your flowers are beautiful, so it's proof that your method works! Thanks Charlene! I use miracle grow as well! But I have never used it in my veg garden. Have you? My MIL uses the osmocote and swears by it! Your flowers are gorgeous and sure proof that it works! Your gardens are my dreams! The rabbit fence will be finished today - garden gets planted tomorrow - and hopefully - lots of flowers, too! Wish me luck! You are the bomb diggity in that glorious garden. I do not fertilize here but make my own compost and put a shovel full of that in with each new planting. I am getting a truck of horse manure soon. That is exciting to me. My Joe thinks it's funny. Those are great tips. I never knew about the weak fertilizer for watering containers. I'll give it a try. Your flowers are so pretty and full. Both products are great and I use them, too. Our growing period is more like 6-7 months and it's difficult to get some plants to thrive over that long a period. I'll try using your method of a weaker solution of the MG. I put MG in the hole when I transplant, too. That seems to help relieve the stress in our heat..zone 7B/8. Thanks for the reminder to feed. Oh, and your flowers look amazing! 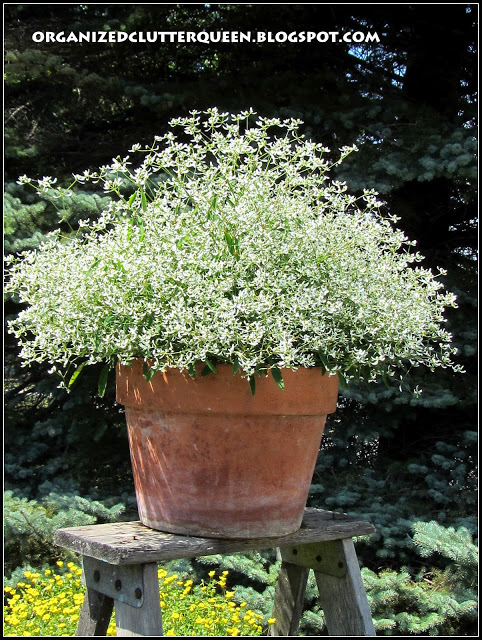 Is that euphorbia "Diamond Frost" in the photo? Love that plant, but forgot to get any this year. Love the results! I am not good about fertilizing, and only do it every once in a while and pretty much give everything the same treatment. I could take some tips from you!